This particular drama happened to start back in early November. Bill, my neighbor from across the street said that I was going to be getting a turkey for the holidays. Great! I like turkey. It isn't Lobster, but I don't have a lobster pot and the idea of plunging a creature into a pot of boiling water is a bit "Medieval" for me. But nobody likes giant hunks of leftover turkey lurking in the refrigerator or freezer. I literally had little bags of leftovers from last year's Thanksgiving feast in July. To compound the drama, I was told it could be as much as a 30 pound bird. As the drum beat of the clock and the march of time got closer to the actual day, we kept thinking about what to do with a 30 pound bird. I'm the only one in the house who eats turkey, and while I can pass a platter back to Bill and Lisa, I was going to be on my own for the Lion's Share of the roast. I don't have a Lion handy. I came across an additional problem. I hate dried out turkey. I mean let's at least "honor" the animal who died for your table by preparing it well. Lets not overcook the breast. This problem is because Turkey Breast should be cooked to an internal temperature of 140, Turkey Thighs are to 180F. Dark Meat likes it hot, White Meat likes it cooler. So I decided to butcher this bird down into pieces. When the actual bird arrived, it was a big bird,but only 17.45 pounds according to the tag. Great! I had a more manageable bird, but it was still too large for my refrigerator. I defrosted it partially and went to work. Cut the bird into pieces. Wings in one bag. Each thigh and drumstick in their own bag. The main body, the white meat went into four different bags. The giblets and the neck are in my refrigerator and I'll be making them separate. So great! Now I have a full freezer and one drumstick and thigh in my refrigerator. The recipe is dead simple! Of course it is, all my recipes are once I break them down. Cook your Dark Meats separate from the White Meats. Season the parts with a rub. In my case, I used the Sylvia's Secret Chicken Rub. Since Sylvia was the Queen of Soul Food, she needed a sceptre, and I suggested a turkey drumstick. All this silliness aside it was cooked as such. Turn heat on oven down to 350 and place prepared Turkey Parts in the oven. 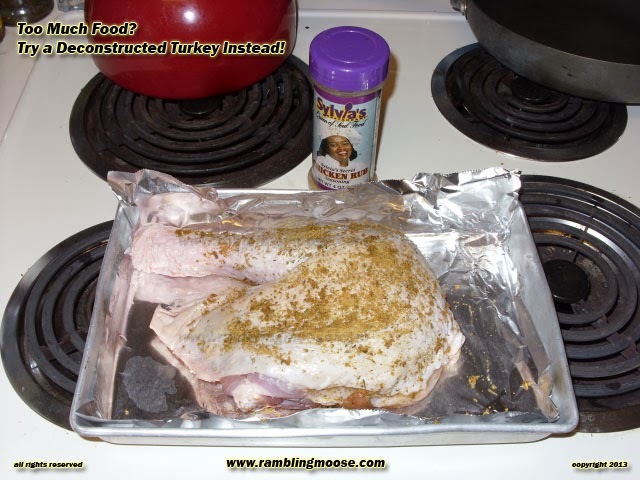 Place Turkey in a baking pan or cookie sheet after rubbing with your favorite spices. Roast DARK Turkey parts for 1 hour or WHITE Turkey parts for 45 minutes and test the internal temperature on the thickest part of the meat. The Turkey parts may not be done at this point, but check every 10 minutes from this point forward. For White Meat, it is done when the meat reaches 140F. For Dark Meat, it is done when the meat reaches 180F. If you really want a treat, you can roast your favorite vegetables at the same time. A Potato or Sweet Potato both will roast in roughly an hour at this temperature. Just score the skin on the potato, and add some spices at this point against the skin inside of the aluminium foil wrap. I had mine with some Stove Top Stuffing but that really is just because I was being traditional. The benefits are that you can cook just what you want, and since you are only roasting for an hour or so, plus or minus, you aren't heating your house for three hours. Too much? Pass some across the street to Bill and Lisa. They like Turkey too!